Carlos L. Arteaga, MD - Play for P.I.N.K. With the support from BCRF/Play for P.I.N.K., we have been able to make important discoveries that will further reduce the mortality and morbidity from ER+ breast cancer. This support has also allowed us to continue to train the next generation of academic breast oncologists. 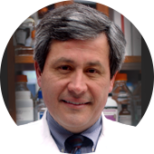 Dr. Arteaga’s BCRF research is focused on understanding why ER-positive tumors become resistant and developing new approaches to improve clinical outcomes. His group has completed a clinical trial in which women with ER-positive breast cancer received the aromatase inhibitor letrozole for 10-21 days prior to surgery (neoadjuvant therapy). Parallel to these studies, they are conducting clinical trials with FGFR1 inhibitors in patients with breast cancers that have high levels of FGFR1. Early results are promising, and they are now initiating studies to combine letrozole with FGFR1 inhibitors and/or CDK4/6 inhibitors in patients with this type of tumor. These studies have important clinical implications for patients with ER+ breast cancer. Tell us about yourself as a scientist and how you became interested in breast cancer research. Did you ever seriously consider another kind of career than that of the sciences? I trained as a physician but not as a scientist. During my early internal medicine training at Emory University, an attending physician and medical oncologist stimulated my interest in cancer medicine. I then went to the University of Texas Health Sciences Center in San Antonio, where I worked with some very enlightened physician-scientists who were studying breast cancer in both the laboratory and the clinic, and were also taking care of patients. I admired that, and I also had the opportunity to see the promise in breast cancer research in several patients who, at the time, were being cured by adjuvant therapy. Stimulated by this example, I decided to add laboratory training to my clinical training in order to become a competitive candidate for an academic position as a physician-scientist, and that’s how it all began. Briefly describe your BCRF-funded research project. What are some laboratory and/or clinical experiences that inspired your work? What are your primary goals for this research? The research project funded by BCRF in my laboratory focuses on the identification of oncogenes (cancer-causing genes) that alter the response of estrogen receptor-positive (ER+) breast cancer cells to hormonal therapies. Hormonal or endocrine therapies work well against breast cancer at least initially, but in many cases they stop working because ER+ breast cancer cells acquire mechanisms of drug resistance. These mechanisms involve oncogenes that negate or reduce the response to these endocrine therapies in patients. So, what are some laboratory and/or clinical experiences that inspired my work? Well, I was very stimulated by the fact that ER+ breast cancer is the most common type of breast cancer, and I would argue that the majority of patients who die from breast cancer do so as the result of ER+ positive metastatic disease. So the opportunity to impact a large group of patients by discovering the mechanisms that make their cancers resistant to hormonal therapies can be significant. Like for many investigators, the development and optimization of molecular methods that comprehensively interrogate tumor DNA and RNA alterations have helped our work. I would also add the use of neoadjuvant trials, the funding of breast cancer research, the role of patients and advocates in these endeavors, the support from the Vanderbilt-Ingram Cancer Center, where I serve, and the increased availability of new targeted therapies and clinical trials, all of which have contributed to our research. What direction(s)/trends do you see emerging in breast cancer research in the next 10 years? I can think of three emerging trends. First, thanks to increasingly sophisticated molecular methods, there will be a deeper analysis of tumors at the time of diagnosis resulting in treatment decisions based on the knowledge gained from these in-depth studies. This will increase treatment options for patients who are not cured by the current standards of care. Secondly, we will be using more and more combination therapies that will be more effective than single therapies; these combinations will be different depending on the type of tumor – eg, ER-positive, triple negative, etc. These combinations will be tested predominantly in the neoadjuvant setting (ie, prior to surgery) and results of these pre-surgical trials will lead to faster approvals of effective and well tolerated new treatment combinations. Finally, as we prolong the lives of patients with breast cancer, there will also be increased research on quality of life and survivorship as well as prevention in patients at high risk of developing breast cancer. Currently, we have several laboratory and translational research projects, but one I would particularly like to mention is our study of residual triple negative breast cancer tumors that remain after treatment with neoadjuvant chemotherapy. These patients have a very high rate of recurrence and death. We propose that by profiling these drug-resistant tumors that remain in the breast after chemotherapy, we will find actionable targets present in micrometastases that can, in turn, be eradicated by targeted therapies instituted immediately after surgery. We hope to find new ways to treat these very aggressive tumors based on our analysis. How close are we to preventing and curing all forms of breast cancer? Although most would agree progress in breast cancer in the last two decades or so has been significant, there is still a lot of work that needs to be done. Cure is a tricky word. The very late recurrences of ER+ breast cancer remind us of how difficult total cure can be. However, through the use of targeted therapies such as trastuzumab, lapatinib, pertuzumab, T-DM1, etc., one cancer subtype we should get close to curing during our lifetime is HER2+ breast cancer. Scientists are also studying the germline DNA from healthy individuals at risk of developing breast cancer. Once we can better define that risk based on the germline DNA and other environmental factors, we would be in a position to implement effective personalized prevention strategies. I believe that in the long run, prevention will have a larger impact than treatment of advanced metastatic disease. Finally, as we understand how it is that some ER+ tumors can remain dormant for many years and then recur late, we should be able to implement therapies – or even lifestyle changes – that prevent these late recurrences and get us closer to a cure. In your opinion, how has BCRF impacted breast cancer research? Many of the studies and investigators funded by BCRF have had major impact in the way we understand the biology of breast cancer and the treatment of the disease. The funding from BCRF has allowed these investigators to mentor and train younger scientists who otherwise would not have joined the field of breast cancer research. BCRF has also supported multidisciplinary research teams which, by harnessing basic and clinical science, are now critical for fast progress. Because of all these reasons, it is fair to say that BCRF’s impact has been enormous. I anticipate this impact will increase in the years to come.